Minutes of a meeting of the Council of the Municipality of Newtown, held at the Town Hall, Newtown, on Tuesday the 15th January 1935, at 7.30pm. His Worship the Mayor, (Alderman R. S. Goddards, J.P.), the Deputy Mayor (Alderman T Sheehan, J.P.)Mrs Alderman Fowler, and Alderman F.A. Newnham, W.P. Newnham, Ryan, Dunshea, Collyer, Fleming, Porter, Roberts and Solomon. Each member of Council having received a copy of the minutes of the previous meeting , Alderman Dunshea moved, “that the minutes be taken as read, and confirmed and signed”. Seconded by Alderman Roberts, and carried. Letter from the M.Water. S. & D. Board, covering a return of building operations in the City and Suburbs for the year 1934. “Received”, and ordered to be laid upon the table. Letter from the Local Government Dept. : “giving details of a vote of £300,000 of Loan Money for Unemployment Relief Works, to assist in placing new Settlers on the land, and also for the construction of bridges etc., “Received”. 3767 Old age & invalid pen; re free use of Town Hall. Letter from the Old Age & Invalid Pensioners’ Assn., Newtown Area, thanking Council forthe free use of the Town Hall for its Meetings on Friday afternoons during the year 1934.”Received”. J.S.Garden, M.H.R. re half-length Telephone Cabinet . Letter per favor of J.S.. Garden, M.R.R., intimating that a half-length Telephone Cabinet will be erected in Pemell St near its intersection with Simmons St., as soon as prior applications have been dealt with. Ald. Sheehan moved, “That the letter be “Received”, and Mr. Garden be congratulated on the success of his efforts on behalf of our Municipality in this matter.” Seconded by Alderman W.P. Newnham, and carried. Letter from the Valuer General, intimating that negotiations are proceeding for the purchase of property at the intersection of Erskineville Rd., & Wilson St., for the purpose of rounding-off the corner. “Received”, on the motion of Alderman Solomon, Seconded by Ald. Roberts. 3770 Public Health Dept Re Milk Samples . Letter from the Department of Public Health, covering the analysis of twenty samples of milk, all of which were found to be correct. “Received”. 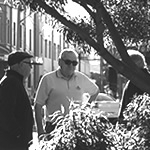 3771 NSW State Council Against War, Re outdoor meetings . Letter from the NSW State Council against War, asking permission to hold Outdoor Meetings on Sunday Evenings in Bedford St., near the Fountain. Ald. Solomon moved, “That the application be “Received”, and granted, subject to Police approval.” Seconded by Ald.Fleming, and carried. Seconded by Alderman Roberts, and carried. Letter from J. Hennessey, asking on behalf of the Old Age & Invalid Pensioners Executive Council, for the free use of the Town Hall on Friday Afternoons for the fortnightly Meetings of the Executive Council during the year 1935. Ald. Solomon moved, “That the letter be “Received”, and it be left in the hands of the Mayor to grant this request when the Town Hall is not otherwise engaged.” Seconded by Alderman Roberts, and carried. Old Age & Invalid Pensioners,Re Euchre party & Dance. Further letter from J. Hennessey, asking for the use of the Town Hall at Charity Rates, for the purpose of holding a Euchre Party & Dance on the 5th February next, in aid of the funds of the Old Age & Invalid Pensioners Executive Council. Ald. Roberts moved, “That the application be “Received”, and granted.” Seconded by Alderman Fleming, and carried. Letter from T. Powell, making application on behalf of the Communist Party of Aus., for the use of the Town Hall at Charity Rates, on Thursday the 17th inst., for the purpose of holding a Lecture on “Lenin”. Ald. Fleming moved, “That the application be “Received”, and granted.” Seconded by Alderman Roberts, and carried. Letter from E. Perry, complaining of the competition of a Fish Stand at the corner of Hordern & King St., “Received”. 3778 Newtown East Labour League re Rockchoppers At Como. Letter from R.A. Baker, Ron. Secretary, of the Newtown East Labour League, asking co-operation in a request to the government to grant the Rook-Choppers at Como and elsewhere employed on Relief Works, – Wages and conditions in accordance with the Award, and further requesting this Council to solicit the co-operation of all Municipalities and Shires in the County of Cumberland in this matter. Ald. Solomon moved, “That the letter be Received”, co-operation as desired, be granted, and the co-operation of all Municipal & Shire Councils in the County of Cumberland be invited”. Seconded by Ald. Sheehan, and carried. Application from W. Walker & Son for Council’s approval of Subdivision Plan of land, – Nos 8 and 10 Bucknell St., It was Resolved on the recommendation of the Works’ Committee,”That the application be “Received”, and granted”. 3780 Pubuc Trustee Re Awning in front 191Wilson St.
Railway Dept Re Footpath on St Peters Bridge. keeping with the adjoining footpath, and that he be again requested to have this work carried out, or pay the Council the cost thereof. 3782 Main Roads Dept. Re Additional work on north side of King St.
Letter from the Main Roads Dept., intimating that in response to.Council’s application, additional work had been approved (in accordance with the Plans approved by this Council) on the northern side of State Highway No. 1. (King St.,) extending easterly from Church St., to a point near Queen St., It was Resolved on the recommendation of the Works’ Committee “That the letter be “Received”, and the Mayor be congratulated on the success of his prompt efforts to have this work carried out, and the Commissioner for Main Roads be also thanked for his prompt approval of the work. 3783 Popplewell & Shepherd re-block of flats Cambridge and Cavendish Streets. Application from D Popplewell & Shepherd for Council’s approval of Plan and Specification of a block of 6 Flats at the corner of Cambridge & Cavendish Streets. It was resolved on the recommendation of the Works and Building Committee “That the application be approved subject to a full compliance with the provisions of Local Government Building Ordinance No 71 including the provision of soundproof floors to the Building Inspector’s approval and to all dividing walls between the Flats being built in 9 inch Brick-work. 3784 Public Health Department re No 2 Sarah Street. Letter from the Department of Public Health asking that Notice be served on the Owner of No 2 Sarah Street to comply with the requirements of Ordinance No 71 relative to Flats. 3785 Plan of Factory Premises 171 Lord Street. Application for Council’s approval of Plan and Specification of Factory premises at 171 Lord Street. It was resolved on the recommendation of the Works & Building Committees that the application be approved provided the lighting and ventilation is increased to at least 1/15th of the Floor area and that all Skylights are of the louvred Ventilating Type. The Monthly Financial Statement of the General Fund was submitted and disclosed a credit balance of £8353.1.6. It was further recommended (a) That a subsidy of £50 be granted to the Newtown-Marrickville Ambulance payable in 2 half yearly payments. (b) That a subsidy of £2 per month be granted to the Newtown Enterprise Silver Band (until otherwise notified) provided the program of each month as to the Finance Committee’s satisfaction. (c) That persons hiring the Town Hall be requested to make their own arrangements with the Australian Performing Rights Association regarding any fees to be paid. 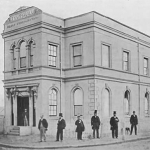 (d) That the rent of the Town Hall for the Ladies Orange Lodge be reduced to 10/-per Meeting. (e) That to adjust the Stores & Materials A/c to 31/12/30 4 A nett amount of £84/5/8 be debited to M & R of Roads and credited to Stores and Materials A/cs for depreciation and stores used which could not be charged to individual Streets. Seconded by Alderman W.A. Newnham and carried. His Worship the Mayor (Alderman R.S. Goddard J.P.) as Chairman of the Works Committee submitted a Report of a Meeting held on the 14th instant as contained on folios 346/7 of the Committee’s Report Book. Seconded by Alderman Porter and carried. Seconded by Alderman Dunshea and carried. The Town Clerk submitted Estimates of Rate Limits for the year 1935 which were “Received” and adopted. Part No 1 Limit of General Rates and Additional General Rates taken together. Town Hall Newtown 15th of January 1935. J Hilton submitted his report of works completed or in progress during the past month which was “Received”. The Assistant Health Inspector submitted his report as contained on folios 73/75 of the Health Inspector’s Report Book. Seconded by Alderman Sheehan and carried. Seconded by Alderman Roberts and carried. 2 “That the following appropriations be made from the General Fund for the year 1935. (j) Provision for coal quitting of roads Town Hall improvements etc. 3 “That the various works which lapsed on the 31st December 1930 or and which are detailed in the Register of Votes Orders and Works as moved by the following Aldermen be now voted under the provisions of Clause 17 of Ordinance 26 “seconded by Alderman Roberts and carried. (a) That Main Road No 1 King Street from Brown Street to George Street eastern side be reconstructed. Estimated cost. (b) That Burren Lane be tarred rolled and surfaced with bituminous emulsion. Estimated cost. “That Bucknell Street Carriageway be repaired where necessary with the bituminous metal and resurfaced and the gutters replaced where necessary in concrete. Seconded by Alderman Solomon and carried. (a) That Church Street be repaired where necessary and top dressed. Estimated cost. 3798 Rounding of corner Liberty and Bedford Streets. (b) That the footpath be rounded off the kerb and gutter set back and the gunny covering altered at the north eastern intersection of Liberty and Bedford Streets. Estimated cost. 3799 Regent and Albemarle Streets Carriageway. (c) That the carriageway at the intersection of Regent and Albemarle streets be ballasted where necessary and re-sheeted with bituminous metal. Estimated cost. (d) That the open crossing is at the intersection of Australia and Lennox Streets be converted into reinforced concrete box drains. Estimated cost. Seconded by Alderman Fleming and carried. (a) That a box culvert reconstructed at the intersection of copies and Whitehorse Streets. Estimated cost. 3801 Gullys in Lord Street. (b) That gullys be constructed in Lord Street and connected along John Street with 15 inch drainpipes to the stormwater drain on the Railway land. Estimated cost. Seconded by Mrs Alderman Fowler and carried. 3802 Gullys in Sarah Street and Marion Lane. (a) That gulleys be constructed on Sarah Street and Marion Lane and connected with 15 inch drainpipes along Sarah Street to Edgeware Road. Estimated cost. 3803 Intercepting Gullies in Reiby Street. (b) That intercepting gullies be constructed in Reiby Street and connected with 15 inch drainpipes to the Sloane Street Stormwater drain. Estimated cost. (c) That Augustus Lane be scarified and re-sheeted with bituminous metal. Estimated cost. 3805 Alderman Fleming called attention to the condition of the Telegraph Pole in Lennox Street by Mr Dibble’s Bakery. 3806 Alderman Collyer drew attention to the condition of the footpath in Darley Street. 3807 Mrs Alderman Fowler drew attention to the condition of the gutters in Newman Street and the footpath in angel Street by the Tramway Running Sheds. 3808 Alderman Ryan drew attention to a bad portion of the Carriageway at the intersection of King and Lords Streets which should be repaired with cement concrete. 3810 Alderman Dunshea drew attention to the dangerous condition of the fence at the Phillip Street Subway and asked that a letter be forwarded to the Railway Department calling attention to the need for immediate repairs. 3811 Alderman F.A. Newnham called attention to the unsightly growth of weeds along the fences and asked that the grass be trimmed or treated with poison also drew attention to the damage being done to the lower end of Marion Street through heavy traffic. 3812 Alderman Collyer asked that the Works’ Committee inspect the corner of Margaret and Reiby Streets with a view to improving the corner. 3813 Alderman Roberts drew attention to the rank growth of weeds in Herbert Street. 3814 Alderman Fleming asked that the Works’ Committee inspect region Street between Bedford and Bishopsgate Streets at its next meeting. 3815 Alderman Sheehan drew attention to the vandalism during the School Holidays of Trees in Juliett Street and it was Resolved “That the Minister for Education be requested to issue instructions to School Teachers within this area to foster a Civic Spirit in the Children so as to prevent the destruction of Trees Electric Light Globes etc. 3816 Alderman Dunshea asked that at its next Meeting the Lighting Committee consider improvements to the lighting of Phillip Street Subway. His Worship the Mayor intimated that the various matters mention would receive his attention will be brought under the notice of the Works or Lighting Committees. 3817 His Worship the Mayor (Alderman R.S. Goddard J.P.) moved “That the Reverend A.E. Walker be thanked for his kindness in placing the Methodists School Hall at the disposal of the Committee that the distribution of Primary Products supplied by the Government during the “Xmas Season”. And there being no further business the meeting terminated. Confirmed at an Ordinary Meeting of the Council held at the Town Hall Newtown on 29th of January 1913 at 7.30pm. Signed W.G. Salmon, Town Clerk R. Goddard, Mayor. Minutes of a Meeting of the Council of the Municipality of Newtown held at the Town Hall Newtown on Tuesday the 29th January 1935 at 7.30pm. His Worship the Mayor (Alderman R.S. Goddard J.P.) Mrs Alderman Fowler and Aldermen Roberts, Solomon, F.A. Newnham, W.P. Newnham, Porter, Ryan, Collyer, Dunshea, and Fleming. 3818 Alderman T Sheehan re absence on account of knee injury. 3819 Milk Produces Association re distribution of milk in Metropolitan Area. Letter from the Secretary of the Milk Producers Association asking co-operation in supporting the Davies Scheme for the control of the Milk Supply etc Alderman Roberts moved “that the letter be “Received”. Seconded by Mrs Alderman Fowler. The voting being in favour of the Amendment it was then submitted to the substantive motion and declared carried. 3820 Hospital Collection Fund re Annual Collection. Letter from the Secretary of the Hospital Collection Fund asking permission to hold the 41st Annual Collection within this area on Friday the 3rd may next. Seconded by Alderman WP Newnham and carried. 3821 Premiers Department re-Iron Spike Fences. Letter from the Under Secretary Premier’s Department (Per favour of F M Burke M.L.A.) intimating that Council’s represent Haitians in respect of Legislation restricting the use of iron spike borders for fences and tree guards will receive consideration. 3822 Minister for Transport re-Drainage Facilities and also Brick Walls etc in connection with Railway property. Letter from the Minister for Transport (Per favour of F M Burke M.L.A.) intimating that Council’s request for proper drainage facilities with galleys and iron gratings to convey the stormwaters across the Railway property and also regarding the erection of brick walls at the foot of Watkin Herbert and Brown Streets and barbed wire on stanchions or brick wall in Bedford Street will receive the Commissioner’s consideration. 3823 Railway Department re Repairs to Phillip Street Subway. Letter from the Railway Department acknowledging Council’s request for repairs to the fence and railing etc at the Phillip Street Subway and intimating that the matter will receive attention. 3824 H Fay Re debris from Fish Stall. Letter from H Fay Enmore Hotel complaining of the nuisance caused by the debris from Prawns Lobsters and Fish sold from a Fish Stand at the intersection of Enmore road and Cambridge Street. 3825 R.S. & S Imperial League re sale of Tin Hats. Letter from the Honourable Secretary of the Returned Sailors & Soldiers Imperial League of Australia asking permission to sell Tin Hats and Buttons within this area on Friday the 15th of March next in aid of the funds of the League. 3826 Federal Municipal & Shire Councils Employees Union. Letter from the Secretary of the Federated Municipal and Shire Councils Employees Union of Australia intimating that the Annual Union Picnic will be held on Friday the 14th of March next at Clifton Gardens. Seconded by Alderman Ryan and carried. Letters from the Balmain Holroyd Waterloo’s Baulkham Hills Petersham Marrickville and Parramatta Councils agreeing to co-operate with this Council in an effort to secure Award Wages and Conditions for the Rock-Choppers employed on Relief Works at Como and elsewhere and also from the Burwood Drummoyne Campbelltown Strathfield and Enfield Councils intimating that it had been decided to take no action in the same matter. 3828 Mrs M Hoolahan re-Dance for Erskineville Convent Queen Competition. 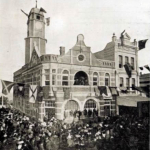 Letter from Mrs M Hoolahan asking for the use of the Town Hall at Charity Rates on the 19th of February next for the purpose of holding a Dance in aid of the candidature of Miss N Hoolahan one of the candidates in the Erskineville Convent Queen Competition. 3829 Reverend R F Dylan re sale of Articles on Vacant Land by St Peters Bridge. Letter from the Reverend R.F. making application for permission for the Ladies Committee of St Columbs’ Church of England Dickson Street to sell various articles on vacant land by the St Peters Railway Bridge on Fridays in aid of the Church Funds. Seconded by Alderman Collyer and carried. 3830 H Dawson re-signs in Connection with Lectures by Newtown Management against War. Letter from H Dawson making application for permission to exhibit say 12 Signs 15 inches by 12 inches in various positions to advertise the Lectures being held by the Newtown Movement against War at 1b Egan Street Newtown. 3831 Miss M Dixon re Beryl Morrin Fund. Letter from Miss Maude Dickson asking Council’s approval and endorsement of her efforts to raise £100 within this Municipality in aid of the fund for little Beryl Morrin victim of the recent Shark Tragedy. Letter from the Erskineville Council asking cooperation in an effort to have a Traffic Constable stationed on the St Peters Railway Bridge to control the traffic at this busy Cross-Road intersection during the peak hours of traffic. 3833 Erskineville Council re Government Subsidy To Newtown Marrickville Ambulance Brigade. Further letter from the Erskineville Council asking cooperation in an effort to secure an increase in the Government Subsidy to the Newtown-Marrickville Ambulance Brigade and intimating that the Erskineville Council’s Subsidy to the Brigade has been increased from 10 two 15 Guineas. 3834 Mrs M A Rush re E.L. Account. Letter from Mrs M A Rush thanking Council for its assistance in having her Electric Light Meter tested free of charge. 3835 Department Road Transport & Tramways re Re-erection of Waiting Room on St Peters Bridge. Letter from the Secretary Department of Road Transport and Tramways (per favour of F.M. Burke M.L.A.) intimating that the Transport Commissioner is still of the opinion that the expenditure necessary for the re-the erection of the Waiting Room on the St Peter’s Railway Bridge would not be warranted that the use of the portion of land will be granted to this Council if it is prepared to erect a Tramway Waiting Shed and maintain it at its (the Council’s) expense. 3836 Town Clerk & Assistant Health Inspector re Annual Holiday Leave. Applications from the Town Clerk (W.G. Solomon) and the Assistant Health Inspector (T.W. Chambers) for Annual Holiday Leave were “Received” and granted. The Engineers submitted his report of works completed or in progress during the past fortnight which was “Received”. The Health Inspector submitted his report as contained on folios 75/6 of the Health Inspector’s Report Book. 3839 Alderman F Newnham re letter under Corporate Seal to Alderman I.E. Ryan J.P.
3840 Mrs Alderman Fowler re penalty on late payment of E.L. Accounts. 3841 Alderman Collyer re-Central Lighting in Holmwood and Dixon Streets. Alderman Collyer asked that the Lighting Committee at its next Meeting inspect the lighting of Holmwood and Dixon Street with a view to substituting Central Lighting that the present foot path lights. His Worship the Mayor said he would have this request complied with. 3842 Alderman Richardson Marrickville – Attendance at Meeting. His Worship the Mayor (Alderman R.S. Goddard J.P.) welcomed Alderman W.C. Richardson of the Marrickville Council who was in attendance during the Evening and also the Honourable J. Tyrell M.L.C. and Mr J.B. Sharpe – both of whom were present to explain the Group Insurance Scheme recently adopted by the Federated Municipal & Shire Councils Employees Union of Australia (N.S.W. Branch). 3843 Committee of Whole re Group Insurance Scheme and Transport Matters. Seconded by Alderman F.A. Newnham and carried. To enter into an Agreement with a Mutual Live Association for the Group Insurance of the Members of its Wages Staff? To compel Members of such Wages Staff to contribute to a Group Insurance Scheme? To deduct sum of 2/-per week from the Men’s Wages as a contribution to such Group Insurance Scheme? To subsidise the 2/-contributed weekly by the Meeting by a similar amount contributed from the Council’s Funds? To impound and hold the Workmen’s Insurance Policy’s so as to prevent money being borrowed on them without Council’s consent. To recover a fair and of the Policies Surrender Value established by the amount of the Council’s subsidy in the event of the Workman leaving Council’s employ before the Policy matures. 3833 Purchase of 2 1 ½ Ton Motor Lorries. Your committee also consider the advisability of purchasing 2 1 ½ ton Motor Libraries for Council’s Transport work in the Engineer’s Department and now recommends “That the further consideration of this matter be deferred pending enquiries as to the relative merits of the “Bedford” “Morris” “Ford” or other types of Motor Lorries and in the meantime it be left in the hands of the Mayor and Engineer to engaged temporary Motor Lorries – the Drivers to be Residence of our Municipality on the Newtown Electoral Roll. Seconded by Alderman F A Newnham and carried. 3834 Alderman Roberts re Vote of Thanks to Alderman Richardson Mr J B Sharpe J Tyrrell MLC. Seconded by Alderman F A Newnham and carried by acclamation. There being no further business the meeting terminated. Confirmed at an Ordinary Meeting of the Council of the Municipality of Newtown held at the Town Hall Newtown on Tuesday the 12th of February 1935. Signed D. Hitchen, Deputy Town Clerk R.Goddard, Mayor.